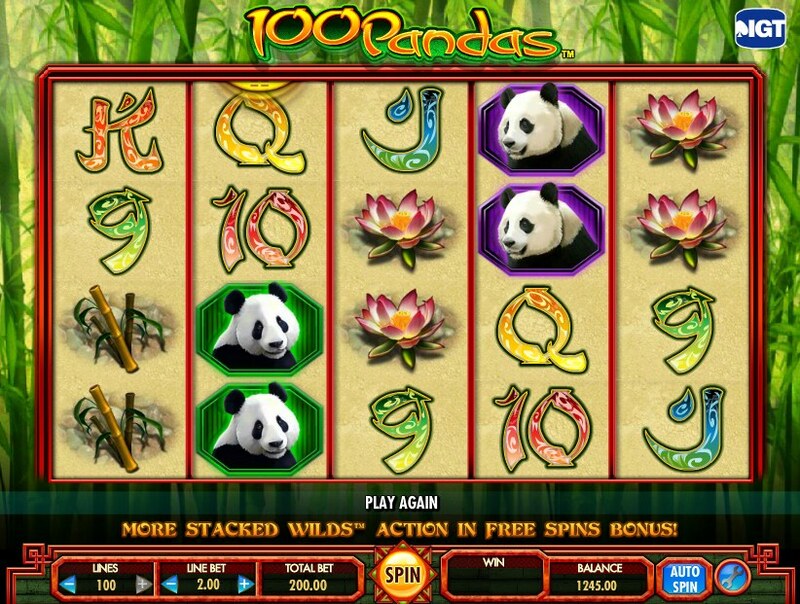 100 Pandas is a 5 reel, 100 payline slot game brought to us by established online slot game developer International Game Technology (IGT). 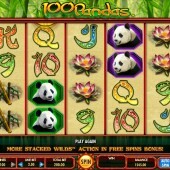 It is a slot that is based on the lovable panda bear. Panda bears are native to the central western and south western region of China and IGT use this fact to incorporate some Chinese themes into the slot including a Ying Yang symbol with the regular playing card symbols also displayed in Chinese font. Bamboo shoots and lotus flowers are also present on the reels as well as pandas against various color backgrounds make up the other regular symbols. Three of Those Pandas are Wild! The Wild symbol is represented by an image of a trio of pandas walking along a pathway against the backdrop of a full moon. This is an icon that fans of Wolf Run will be familiar with. The Wild symbol substitutes for all other symbols except for the Ying Yang scatter symbol to complete winning combinations. The game comes with a Stacked Wilds feature that is available during regular game play. This means that players have an extra chance to win big with the Wilds and do not have to rely on looking for the five Wild symbols or the scatter symbols to trigger a large prize. It is even possible to get a couple of stacked wild reels on a spin which will see you win a staggering amount. There is a free spins bonus round and this is triggered when you hit three or more Ying Yang scatter symbols in any position on reels 2, 3 and 4. You will immediately be awarded with 10 free spins and a 2x multiplier. You can re-trigger the free spins during the free spins bonus round by hitting three or more scatter symbols across the reels with a free spin. You can re-trigger up to 255 free spins so there is huge potential to win big if you are fortunate enough to re-trigger the free spins a number of times. 100 Pandas is a game that will appeal to players who love the big wins. You might spend a while striving to hit the big win without ending your session with much to show for it but you could also put little effort in and strike the big win. The Stacked Wilds feature is a fantastic feature included by IGT and it is a major reason for why this slot is one of the most exciting IGT titles out there right now. The purists will claim that this is no Egyptian themed Cleopatra on the entertainment level but it definitely has a huge fan base and it is easy to see why.